Sherry Tang appeared on Show 220, recorded in October 2010, at age 12. 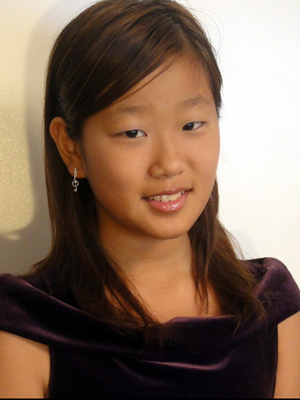 Sherry Tang (piano), 12, lives in Monterey Park, California where she attends Repetto Elementary School. She is a recipient of From the Top’s Jack Kent Cooke Young Artist Award. She has been playing the piano and violin since the age of five, and currently plays in the Alhambra All-City Orchestra and studies piano with Michelle Jo Santoso. Sherry has participated in master classes with Rueibin Chen and Robert Lehrbaumer and last year she performed at the Weill Recital Hall at Carnegie Hall. Aside from music, Sherry enjoys playing badminton, scrabble, soccer, and checkers. Sherry is a Jack Kent Cooke Young Artist.